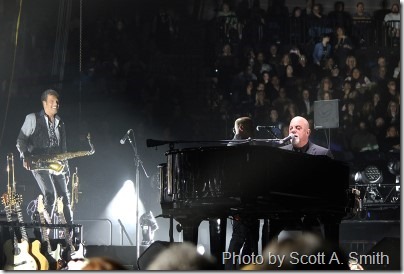 Piano man Billy Joel dished up stunning versions of “Miami 2017 (Seen the Lights Go Out on Broadway),” “Pressure,” “Goodnight Saigon,” “Allentown” and “New York State of Mind” on Nov. 11 at the BOK Center in Tulsa, Okla.
And that was just in the first half-hour of the Rock and Roll Hall of Fame inductee’s spectacular 150-minute gig inside a captivated, capacity audience. Joel and his most excellent multi-instrumentalists were more than happy to dive into Joel’s expansive, hit-filled catalog to present a perfectly crafted, well-executed set list for the multi-generational crowd. Before the stark, somber piano notes started “Goodnight Saigon,” the stage lights darkened as a synthesizer recreated the blaring, wind-slicing sounds a large helicopter. Seconds after Joel started singing the song, nearly a dozen military veterans stepped out in front of the drum set and percussion area before being baked in the audience’s rapturous cheers, whistles and hand claps. It was a musical-and-visual display fitting for Veterans Day. Joel’s vocal chops and piano-playing fingers and thumbs were astounding, as were the efforts given by his stellar backup band. Joel’s fingers were gentle on the keys when necessary, and at other times for the harder-rocking offerings, the fingers got playfully, appropriately busy. Yes, Joel is one of rock’s biggest hit-makers, but he also likes to wink frequently at his audience and veer off the beaten path. It was a welcomed shock that Joel let a key road-crew member, who was introduced as “Chainsaw,” commandeer the lead-vocal mic for five minutes. Doing his best Bon-Scott impersonation — and it was really good — Chainsaw led Joel and the other musicians through a faithful version of AC/DC’s “Highway to Hell.” Joel, with a sunburst-colored Fender Stratocaster, strapped at his hip, even played Angus Young’s gritty guitar intro with absolute accuracy. The wonderfully word-heavy “We Didn’t Start the Fire” took on an added quality on the Tulsa stage, with images of Michael Jackson, politicians and Ozzy Osbourne’s “Blizzard of Oz” album cover accompanying Joel’s vocals that touched upon punk rock, influential literature, heavy-metal suicides, AIDS, crack, astronauts and rock-and-roller cola wars. The peppy “Uptown Girl,” Joel’s affectionately crafted ode to Frankie Valli and the Four Seasons from 1983, arrived as the first of five tracks in the encore set. As the song’s snappy rhythm pulsated and popped, Joel once again stepped away from his piano to cradle the sleek, chrome mic stand. For the 42nd time that evening, Joel’s vocals proved to be in peak-performance mode. Next came the infectious, sassy grooves of “It’s Still Rock and Roll To Me” and the stomping patterns and double-time changes of “Big Shot,” paving the sonic way for the bittersweet optimism that frames “Only the Good Die Young.” When the concert struck the 140-minute mark, Joel launched into the night’s final composition, the rousing, Faces-meets-1974-David-Bowie “You May Be Right.” With its “Rebel Rebel”-esque guitar riff and lyrics that reveal a narrator who flip-flops between being a likable ruffian and responsible, caring adult, “You May Be Right” was the perfect show-closer to an energetic, perfectly paced gig. 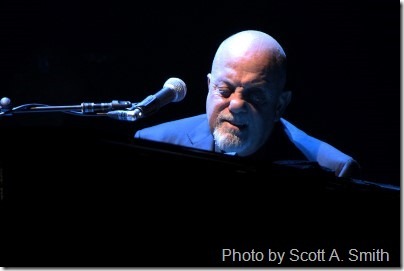 And I may be right that this concert gave loud-and-proud proof that Billy Joel, still to this day, is THE faux-lunatic front-man you’re looking for when it comes to the topic of truly peerless performers. Go see and hear Joel on the stage, before it’s too late.